A HANDSOME AND LOVING GUY: 2 years old / small Mostly Mutts adoption center is open Mon-Sat. 11-4pm. Some of us are in foster homes so please call 770-272-6888 1st to find out if I’m available to meet during the week. Hi there! My name is Finch! I am a very sweet and easy going fellow who is looking for a loving home where I can relax and soak up attention from my furever family. I am friendly and social with (and seem somewhat protective of) the other kitties I came to Mostly Mutts with, so if you have other furry friends at home, we should get along fine with proper introduction. 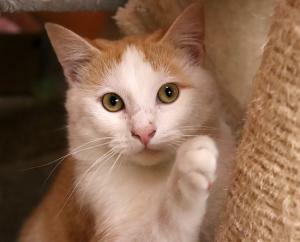 I am as handsome as I am sweet, and I bet you will love petting my super soft coat. I enjoy sitting in the window sill or kitty perch in the Kitty Aquarium at the shelter and surveying all the goings on. I am keeping an eye out for my furever family, so come meet me soon! Gentle children only as I'm a kitty. I'm current on vaccinations, neutered, combo tested negative, micro-chipped and I will come with an engraved name tag. My Adoption fee is $175.00.